What if finding spectacular monologues were as easy as rubbing a magic lamp? Hi, I'm Gabriel Davis creator of Monologue Genie - a website designed to help you find great audition monologues fast. Why did I create such a website? Because, basically, I feel your pain. Before earning my MFA in Playwriting from Carnegie Mellon School of Drama, I was an acting major and I can't begin to tell you how many hours I spent searching through monologue books for the right material. 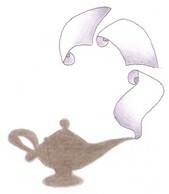 If only finding great audition pieces had been as easy as rubbing a magic lamp. Hopefully, with me on your side to help, it can be! Peruse the monologue categories below to find the perfect monologue for you. Happy hunting! Learn to write your own spectacular monologues: Monologue Writing 101.